Definition at line 238 of file lookahead-matcher.h. Definition at line 241 of file lookahead-matcher.h. Definition at line 240 of file lookahead-matcher.h. Definition at line 242 of file lookahead-matcher.h. Definition at line 245 of file lookahead-matcher.h. Definition at line 243 of file lookahead-matcher.h. Definition at line 244 of file lookahead-matcher.h. Definition at line 254 of file lookahead-matcher.h. Definition at line 257 of file lookahead-matcher.h. Definition at line 266 of file lookahead-matcher.h. Definition at line 275 of file lookahead-matcher.h. Definition at line 283 of file lookahead-matcher.h. Definition at line 296 of file lookahead-matcher.h. 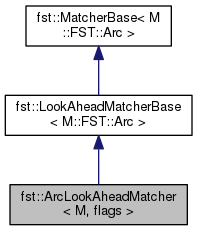 Reimplemented from fst::MatcherBase< M::FST::Arc >. Definition at line 302 of file lookahead-matcher.h. Definition at line 294 of file lookahead-matcher.h. Definition at line 312 of file lookahead-matcher.h. Definition at line 317 of file lookahead-matcher.h. Definition at line 306 of file lookahead-matcher.h. Definition at line 319 of file lookahead-matcher.h. Definition at line 325 of file lookahead-matcher.h. Definition at line 343 of file lookahead-matcher.h. Definition at line 333 of file lookahead-matcher.h. Definition at line 300 of file lookahead-matcher.h. Definition at line 304 of file lookahead-matcher.h. Definition at line 308 of file lookahead-matcher.h. Definition at line 289 of file lookahead-matcher.h. Definition at line 287 of file lookahead-matcher.h. Definition at line 298 of file lookahead-matcher.h.